Scary Monsters magazine #81 - Brains, Craniums and Heads Oh My! 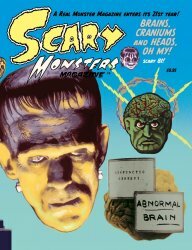 MyMovieMonsters.com > Scary Monsters Magazine > Scary Monsters 1-100 > Scary Monsters magazine #81 - Brains, Craniums and Heads Oh My! The 81st Issue of Scary Monsters magazine proudly entering it's 21st year-- this issue featuring Brains, Craniums and heads, oh my! Brains, Craniums and Heads, Oh My! Big Scares for Little Kids! 148 scary pages. See our MyMovieMonsters.com ad on page 126! All other ads, contact information and website addresses appearing in this magazine are no longer in effect. Please direct all inquiries to scarymonsters@mymoviemonsters.com.